San Antonio Spurs small forward Kawhi Leonard watches from the bench during the first half against the Cleveland Cavaliers at AT&T Center. The Sixers' offseason still feels pretty far away at this point, even after Philadelphia took a disheartening 117-101 loss at the hands of the Boston Celtics in Game 1. But even then, you could feel the void of another surefire offensive star on the floor on Monday night, prompting dreams of what the Sixers might do to address their holes in the summers to come. What would a Kawhi Leonard trade package look like for Sixers, and should they do it? Out of the blue, a path forward has been lit for the Sixers. 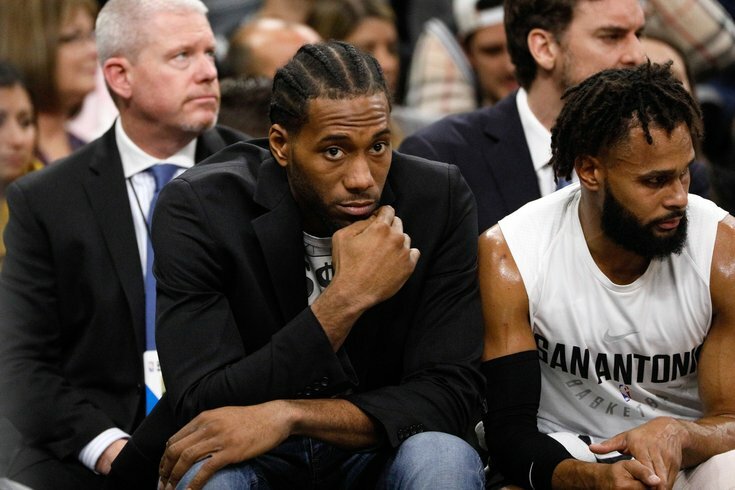 In a detailed and must-read piece from ESPN's Ramona Shelburne and Mike C. Wright, the pair of reporters exposed all sorts of internal conflicts between the San Antonio Spurs and their star player, Kawhi Leonard. At the center of it all appears to be the influence of Leonard's representation, comprised of his agent, Mitch Frankel, and his uncle, Dennis Robertson. There have been whispers to this effect for months, but nothing to this level of certainty and certainly not with the specificity of the teams they might try to guide him to. This connection is a little more tenuous than it would be if someone was reporting that Leonard wanted to force a move somewhere like Philadelphia, but it is hard to treat him as a separate entity from "his group" when they are being treated as a singular entity by the Spurs themselves in the press. For this belief to exist within the Spurs organization says a lot, and that's before acknowledging how out of character it is for a detail like this to emerge from San Antonio at all. The Sixers are a near perfect fit for Leonard's talents if indeed they have a partner willing to have discussions in the Spurs. Leonard is just about the perfect player to throw into Brett Brown's system and his philosophical ideal of what an NBA wing should be in 2018. He can break you down in the halfcourt, get stops on the defensive end, and tear down the court in transition when the moment calls for it. Leonard is capable of shouldering a heavy load on the offensive end — his usage rate soared over 31 percent in 2016-17 — but he is unselfish enough to play within the confines of a ball-sharing offense and do the hard work away from the ball. This is to say, he's the exact sort of player they need in tough losses like the one they suffered in Game 1, and the perfect compliment to Joel Embiid and Ben Simmons. Whether the Sixers are willing to put major chips on the table to go out and get him is a different story. Their connections to the Spurs through Brown give them a level of insight into what's going on that is not even apparent in a story detailed as the ESPN piece. The health issue and overarching dispute facing Leonard is a major question mark, and the Sixers would have to think long and hard about cashing in their chips on a player whose health and relationship with his current team are in doubt. Is that the sort of player and situation you want to gamble your future on, having already invested a lot of money to build around Embiid? That's hard to say. Regardless, Leonard's uncertain future in San Antonio will continue to hang over the NBA until someone or something changes. Given Leonard's preference for silence, his impending free agency in 2019-20, and the interest from teams like Philadelphia in players who can put them over the top, expect a lot more connections between Leonard and the upstart Sixers in the months to come.